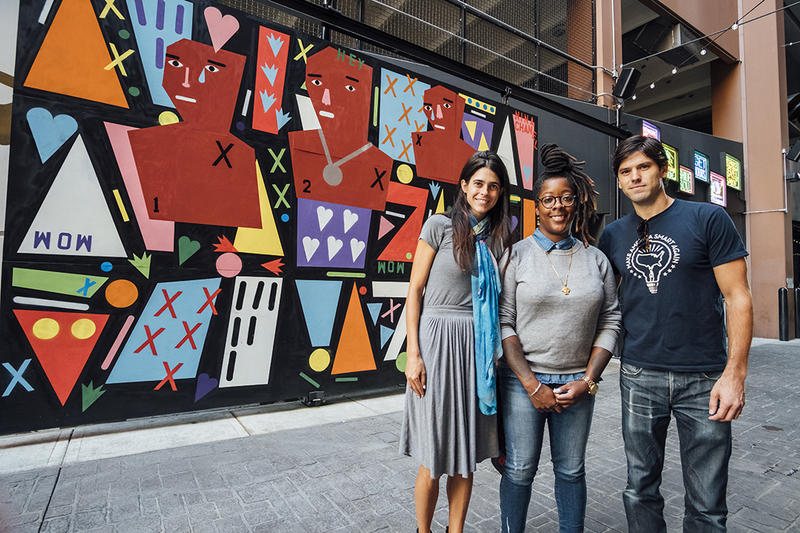 Library Street Collective partner Anthony Curis has helped spread public art in Detroit through murals in the Z garage and Belt and new sculptures like KAWS. He shares his hopes for the future of public art in the city. 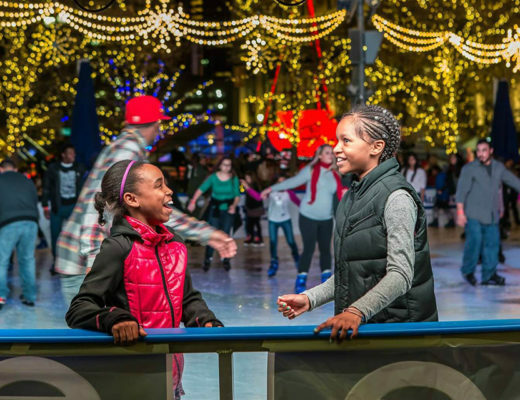 The story of Detroit’s renaissance continues to make national headlines. For the city — and the people that call Detroit home — the shift from recessionary poster child to model of urban renewal has been incredibly gratifying. The resurgence has been a particular thrill for those who live or work in downtown. 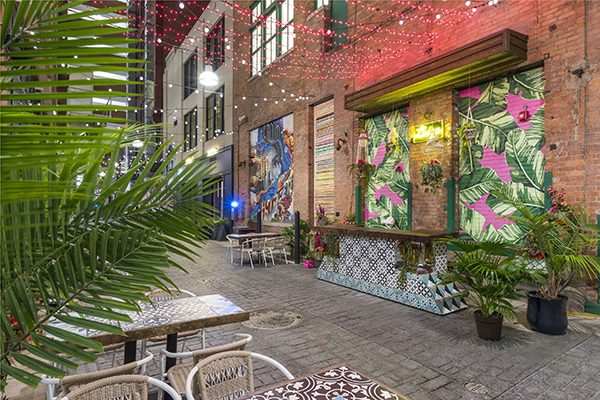 While the stories of Detroit’s turnaround understandably focus on its strengthening economy and expanded economic opportunities, one important chapter in Detroit’s recovery has been somewhat underreported — art and culture; in particular the role of public art and its ability to help build and sustain public spaces and enhance the power of community. In a place like Detroit, where a large number of aging and historic structures — as well as neighborhoods with civic infrastructure badly in need of updates — present both challenges and opportunities, public art can play an especially important role in beautification, outlook and community engagement. 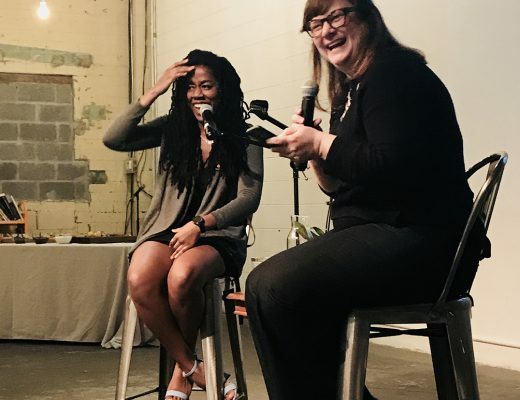 When my wife JJ and I (pictured above with artist Nina Chanel Abney) founded Library Street Collective six years ago, our goal was to look beyond the traditional model of most commercial galleries. We have always had an interest in bringing contemporary art to public spaces. Detroit has a rich history in arts and culture, and we saw a chance to not only pursue our growing interest in the arts, but to potentially be a catalyst to help spark a renewal in Detroit’s civic art scene. A party in the Belt in downtown Detroit. At Library Street Collective, we believe in, support and advocate for emerging and established artists who push the boundaries of traditional media and exhibition space. 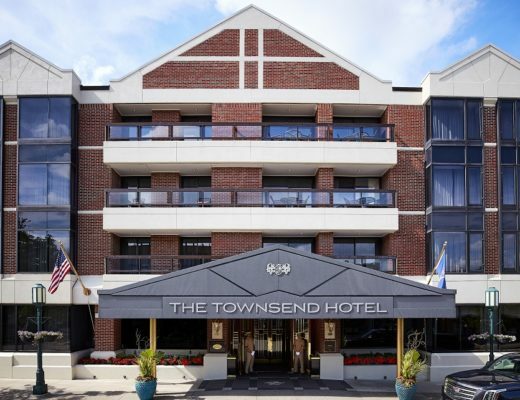 Our gallery is located in the heart of downtown Detroit, giving us a front row seat to the city’s persevering revival. We not only present regular solo and group exhibitions, but we help fund and promote innovative and inspiring public art projects throughout the city. We’ve seen firsthand how powerful public art can be — and we’ve witnessed the impact it can have on both residents and visitors alike. We now know from firsthand experience that public art is a fundamental consideration of any strong community, and we are proud to do our part to contribute to the artistic renaissance of the city’s public, private and heritage spaces. 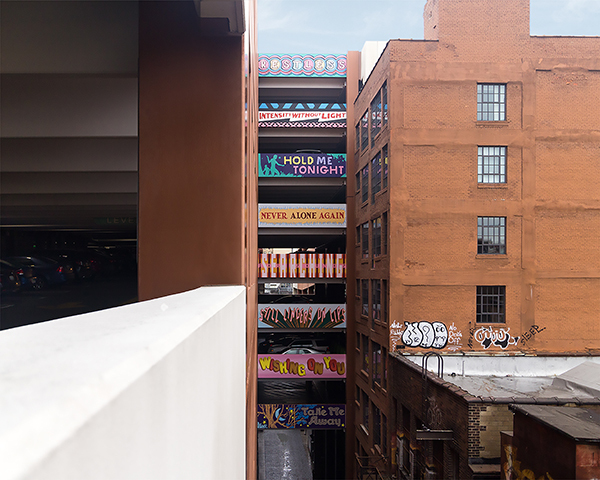 Our involvement in the Z Parking Garage — a drive-in art gallery of sorts — marked our first public art project in the city. The Z features large-scale murals commissioned by 27 international artists from Australia to Ukraine painted throughout the interior of the garage, and its initiation sparked a reconsideration of every design element of the structure, from the architecture to its signage. An overpass mural by FAILE in the Belt. That project quickly became a neighborhood landmark and ultimately energized an ever-expanding list of creative opportunities for us. 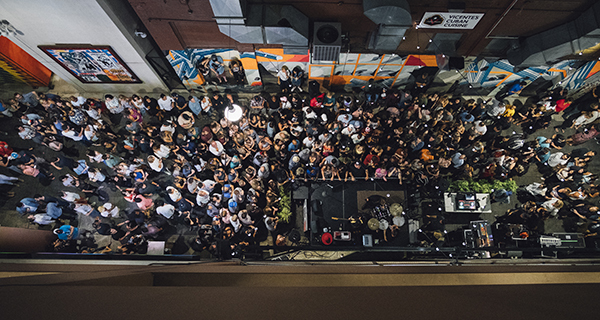 The next was the Belt, a culturally redefined alley located between the Z and Library Street Collective that we have redeveloped and curated, featuring dozens of murals, sculpture and installations from artists such as Nina Chanel Abney, Carlos Rolón, Tom Fruin, Rosson Crow, Tiff Massey, Patrick Martinez and Ellen Rutt. The Belt also features the James Beard-nominated restaurant, Standby, and its outdoor counterpart, the Skip, with our newest venture, Deluxx Fluxx, which opened in early August. 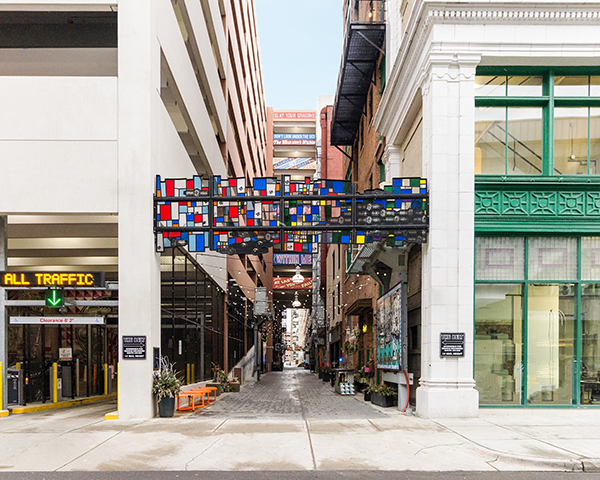 The Belt subsequently came to life as a pedestrian artery and reinforced the notion that art has the potential to completely transform public space. It’s hard to imagine, but just a few years ago that alley was a dirt road, and now it’s one of the busiest pedestrian spaces in the city. Installation view of Tom Fruin’s Grand Rive Gate in the Belt. Loiza, a site specific installation with functional sculptures by Carlos Rolón in the Belt. Public art projects on this scale often involve private stakeholders — and consequently require an enthusiastic and willing partner. Dan and Jennifer Gilbert have been great supporters in so many of these artistic endeavors over the past several years. Needless to say, art is a great way to inspire collaboration. 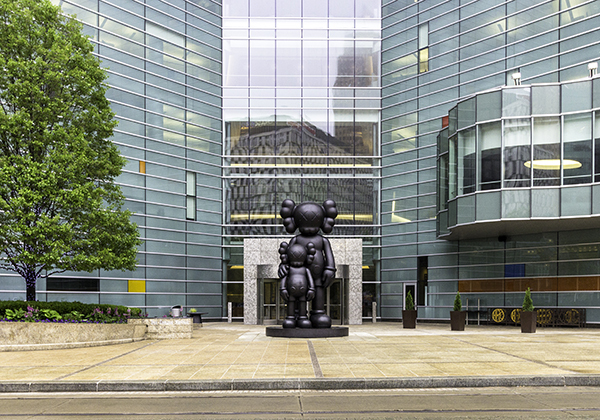 We recently installed a monumental 17-foot bronze sculpture, “Waiting,” by KAWS at One Campus Martius (directly in front of Campus Martius Park), at an opening event that was attended by thousands. KAWS at One Camptius Martius. 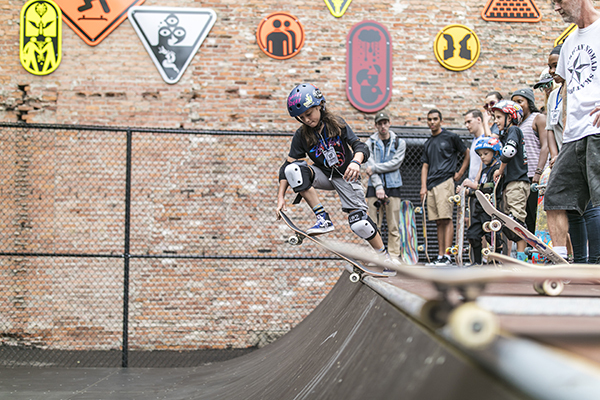 And we are especially proud of Wayfinding, a skate park and art installation that we produced with expert design input from legendary skateboarder Tony Hawk and acclaimed artist Ryan McGinness in partnership with Cranbrook Art Museum. The result was not only a functional piece of public art, but also a place to gather and the first public skate park in downtown Detroit. 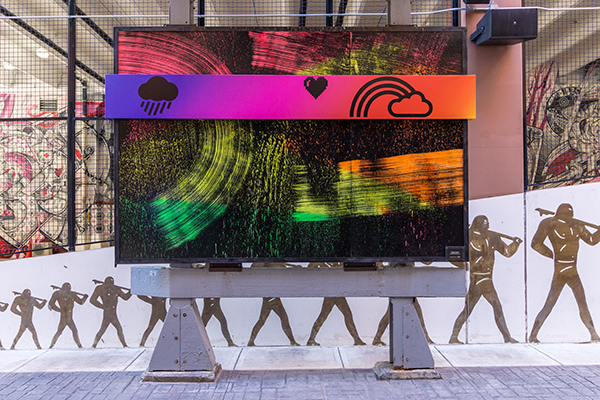 An installation view of Ryan McGinness and Tony Hawk’s Wayfinding. One of the best parts about public and community art is that its potential allows you to think big and to respond to the energy and needs of the city itself. 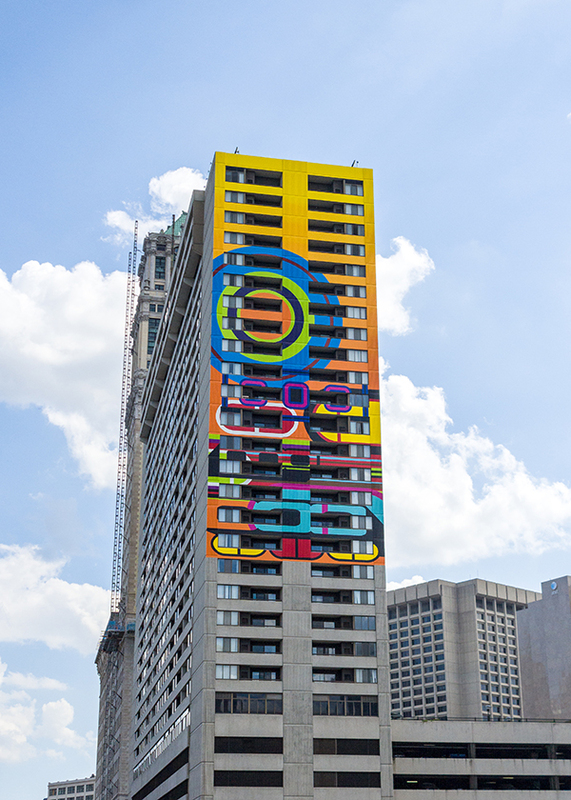 This is particularly evident at the Detroit City Club apartments on Washington Boulevard, where a breathtaking 180- by 60-foot mural by Beverly Fishman has transformed the outside of the building into a vibrant piece of public art. Fishman is the artist-in-residence and head of the painting department at the Cranbook Academy of Art. The shapes, colors and contours of Fishman’s mural, aptly titled “RISE,” provide a nice balance to the brutalist-style architecture of the building. We worked closely with Jonathan Holtzman and his team to bring this project to life. Beverly Fishman’s mural, “RISE,” at the Detroit City Club Apartment Building. We have a number of public projects in the pipeline, including plans to revitalize underutilized heritage and community spaces in the city — from sky bridges to city parks. We are particularly excited about recreating an early 1970s Detroit art initiative, which features a series of geometric murals around the city from 13 renowned artists. We’ve begun by connecting with the original artists, many of whom have been creating influential work for decades and are especially deserving of recognition and celebration. Art is inherently subjective and variable, so it can be difficult to anticipate the response when it comes to any one specific art project. 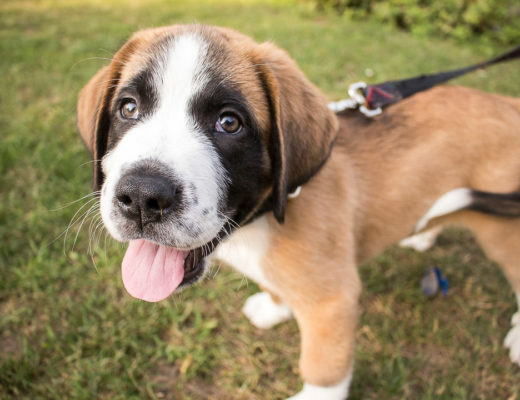 It’s been deeply gratifying, however, to see the overwhelmingly positive reaction from Detroit residents to many of the public projects that have been unveiled in recent years. What is most important is the dialogue that these projects create. They have inspired people to ask questions and sparked productive conversations about the future of the city and public spaces we all share. That public discussion is especially important in a city like Detroit at a time when there are so many important decisions to made about the future. Wendy White’s Rainbow Bridge (Déjà Vu) included in Public Matter: XERISCAPE in the Belt. The public art renaissance has grown along with the city, which now boasts a dynamic and thriving civic center. While many early efforts were focused on activation and beautification, we expect to see increasingly experimental and unconventional projects in the future. At Library Collective, we will continue to do our part to help bring both world-renowned artists and exciting new work to a reimagined Detroit. Anthony Curis is a partner with Library Street Collective on Library Street in Detroit. You can reach him at 313-600-7443 or anthony@lscgallery.com.